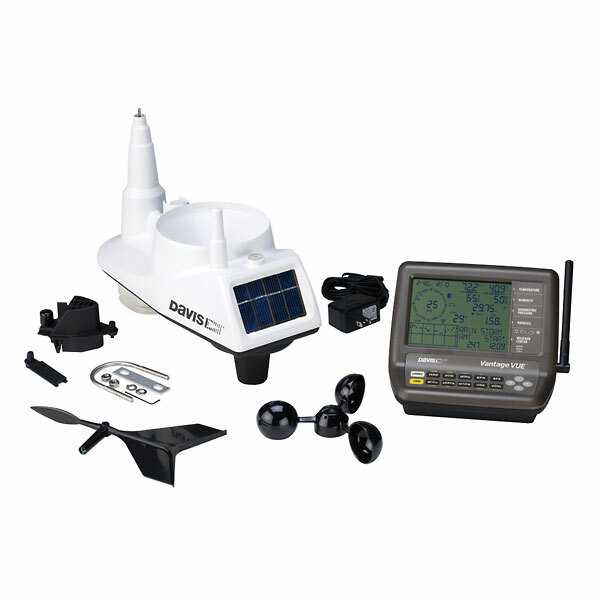 Davis Instruments Vantage Vue® Wireless Station, includes console and sensor suite. WO-30001-97 was succesfully added to your cart. Order both Sensor suite and console for a complete system. Available for sale in the United States and Canada only. Rain fall range 0 to 199.99"
Dimensions Console: 7-1/2" W x 5-3/4" H x 4-1/2"
About a week ago I started getting an outside temperature reading for the outside unit of -40F. The temp is actually closer to 80F. I later noticed that I get this message on my console "BATTERY LOW TRANSMITTER". I replaced the battery but still getting the strange reading and message. Please contact our Applications Department directly to do troubleshooting on the Vantage Vue unit you have. When I purchase a Vantage Vue 6250 what additional items do I need to connect to WunderMap? I want to connect without a computer running 24/7. That is not true - you need to have a computer to setup to export the data to outside sources. DO-99800-65. You do not need to have your computer on in order for the software to work. My Vantage Vue is sometimes doubling the amount of rainfall I receive after the rain has stopped both for the day and cumulative total. For the 2016 year is has over 111" which is approx. 85" to much. The monthly total for July is 2.82" which is correct. I live 8 miles from DFW Airport which is our recording station for the Dallas Fort Worth area. Please call our Applications Department directly to do troubleshooting of your Vantage Vue. Go into Setup and verify the altitude setting is correct: altitudes below 1000' must be in the form of 0xxx; for example, in Chicago it would read 0880. Over 1000' of course enter all four digits of the altitude. If an altitude of 880 were entered such that the first digit is not a 0, and you are actually at 880', the system thinks you are at 8800 feet and won't believe the actual barometric reading, so it dashes out as being invalid. Correct the altitude entry to eliminate the problem. This unit will not be able to predict weather, including wind. Asked on 4/29/2016 by Martin from Holland MI. The part number for the lithium battery will be 34542-91. I am a ham operator. Can this unit be interfaced with a pc to be used on aprs and can it be viewed on my home network? You would need to purchase in addition the weatherlink software for aprs which would be item 00213TG. I love my weather station! However, the outside temperature stopped recording? What to do? Everything else is fine. If you are currently seeing dashed lines where the outside temperature should be it may just be a configuration issue. Please go to setup and make sure that the station is set for the proper location (default is station 1). On the second setup screen you should make sure that you are seeing VUE and underneath it should say ISS. On the next set up screen, make sure that re-transmit is off. With the combination of station 1, vue iss, and re-transmit off your outside temperature should be working fine again. My Vantage View rain sensor is not working, even after torrential rains I get no readings. I checked the rain module, no obstructions, tipping works fine, magnet is clean, water drains out and I am at a loss. This seems to be problematic with the Vantage View stations. Can you help? The rain sensor inside the ISS has stopped working, if the unit is not too old you can have a new sensor sent out to install yourself or send the unit in and they will replace it for you. Usually the the funnel is clogged with debris. If you have checked this, I would recommend contacting the Davis Instruments technical support at support@davisnet.com for detailed troubleshooting help. I WISH YOU GUYS WOULD GET IN COMPUTOR BUSNESS. Purchased for home use. Setup was easy and instructions clear. Great accuracy on temperature. Wind speed and direction seem to have stated accuracy. Still checking humidity. Basic info is always on screen. So much other information on console it is going to take a while to get proficient at using it. I have purchased many instruments from Davis and Cole Parmer for engineering research. Always high quality. Great value. I owned a wired system for 15 years that worked great. After 1 yr it din't register the rain correctly. In fact it records rain fall when it's not raining. Got a new sensor, battery, and changed the channel. Nothing worked. Save your money and go for the wired system. This is my personal weather station. I depend on it all the time for daily, wind, weather and temperatures. I love it, I might add. Everything is great about it for the price. I've had cheaper brands and they don't compare. Love the wireless transmitting also. Things that aren't too great are the fact that hail storms can break the pointer and the wind cups. It has taken two storms that caused the roof to be replaced each time and a pointer one time and one of the cups on the last storm. Maybe silicone wind things would be an improvement. I love the easy reference to the items on the display. Also the min, max, and total to date. Very satisfied with product and support. I purchased the Vue Model. The wind indicator malfunctioned. A call to support determined the sensor was defective. They shipped a new unit and assisted in making sure all was working correctely. I was impressed with their expertise and concern in resolving the problem and promptness in resolving it. I use the Davis weather console for my own personal use to tell the inside and outside temperature, the wind chill, the humidity, in and out, dew point and wind speed and it is very accurate. Great product. I have an 8 year old Weather Monitor 2 and the Vantage View is more compact, easier to change battery and water proof. It was easy to assemble. I use it in a motorhome inside a warehouse and the outside unit is about 150 feet away. Works great. Use it to report my local data to MMWS, through Weather Underground station base. I purchased a Vantage Prosystem for my wife about 12 years ago. It worked very reliably, with only an occasional battery change, for all that time, but recently several issues all appeared at once. The unit was obsolete and it seemed reasonable to simply replace it. I replaced it with a Vantage View and am very happy. The new unit cost a lot less and seems to do everything the old one did and then some in a smaller format. Installation was a breeze. Great product. If the new unit is as reliable as my old one, it may last longer than I do! Would lke to have been able to add an off-set to the Wind speed since the wind is somewhat obscured by near bldgs. It consistently indicates about 75% to 85% low relative to nearby anemometers. Compared to other brands I have used , this is by far the best. It is overall well made, but the thing that I am most impressed with is the range of reception. I have the unit mounted on a 12 ft pole 400 + feet from the house plus the signal has to go through 24 inch stone walls of my 1850s field stone farm house with other solid structures and spruce trees in the line of site. Try that with your other brands. I think some of the problems that are being reported are probably due to bad location choices. Originally I had a temporary mount closer to the house which resulted in poor wind speed tracking. This was due to trees and other obstructions in the general area.It is now mounted in an open field. I have the console sitting on my kitchen desk and look up often to check the stats. We even gave one to a family member for Christmas. There's not a better tool for weather lovers! Love the quality, love the fit and finish, love the easy access thumbscrew doors, good size and really simple to install. For the price, its worth every penny. After 22 years Army flight experience, tracking the weather has become a hobby. Worked perfectly out of the box, no failures. Arizona rain is hard to come by, but only storm in 30 days registered .07". AWESOME. Best buy in the industry. Thanks!!! I was told this was the best weather station to buy for the money. It was very easy to install, however- it consistantly reads -43.2 degrees for an outside temperature daily (it's over 100degrees here!) and the wind reads 8mph or lower even in the middle of a thunderstorm with 50mph+ gusts.... waiting for a response from technical support as we speak. We are both private pilots and keep our airplane here in Alaska ready to go. The weather here can change in a heartbeat, and we need to be very careful to note any changes we can't see. This instrument, as well as taking a long look outside the window, aids us in making good decisions on whether to "go" or "no-go." Two possible improvements on a fantastic product. The wind direction indicator on the wind rose should be a litter larger. The ISS should utilize a rechargable Lithium-Ion CR123 battery and be recharged from the solar cell. We wanted to have a weather station with multiple receiving consoles for our condominium residents. I worked with a Davis tech consultant via e-mail and phone to design a system that would work throughout our complex. He was very helpful and professional. We installed the system last week and had one glitch (my error) which the Davis tech support cleared up over the phone. All the condo owners that bought into the system are very well pleased. A great product. The information it gathers, records and produces is far in excess of my expectations. I recommend this product highly. Purchased primarily for wind data; found anemometer to be highly inaccurate. ? 4mph wind blowing hat off? Then the backup battery issue started. Replaced battery. Warning still on. Battery goes dead. Tech support hasn't responded to email. Unit is now not functioning. Very disappointed. console has so many features that it takes some fussing to get familiar but it tells more than you'd ever need to know about all weather measurements. both units (indoor console and outside sensor suite) are completely wireless so you can move the console around the house easily. Add a second wireless interface to easily "Vue" accurate weather data from multiple locations. Easy to set up and use and provides up to the minute weather conditions. Great for planning fishing trips!